This week we have finished the AI behavior of the Undead Soldier with the new animations, and started testing the group control with various enemies of this type, as well as with the big Ancestor Soldiers. 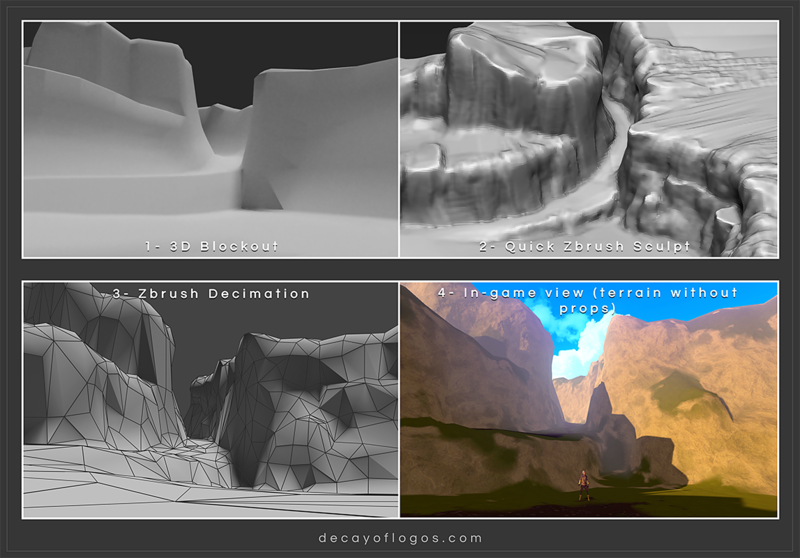 The game model for the latter is already completed, as you can see in the GIF below. While exploring the battlefield area, if the player isn’t aware of the surroundings, several enemies can be triggered to attack. Mind the bodies lying around! As always, various small bug fixes and small details were added to the code; a feature that was planned a long time ago was finally implemented – the dual weapon logic for the enemies. To put it simply, the enemies equipped with bows will now draw their swords for close combat situations, for example. Lastly, we’ve also added the Ancestor Soldier’s Mace and helmet to the game as wearable player items. For the larger terrains we’re currently working on, the team has been trying out quick ways to achieve good results. The image below shows our simple pipeline to produce that kind of content, static environment parts. We first come up with a basic blockout of the scene, then we take it to Zbrush and refine the shapes and silhouettes, while keeping the model rough (since most details will be lost in the following step). Afterwards, the resulting mesh gets decimated, using Decimation Master. A little cleanup is often required, but after the UV’s are ready we bring the whole thing into Unity and start giving it life with Vertex Painting. This entry was posted in Animation, Level Design, WIP and tagged 3D, Animation, Props, Showcase, Technical, WIP on June 2, 2017 by Andre Constantino.